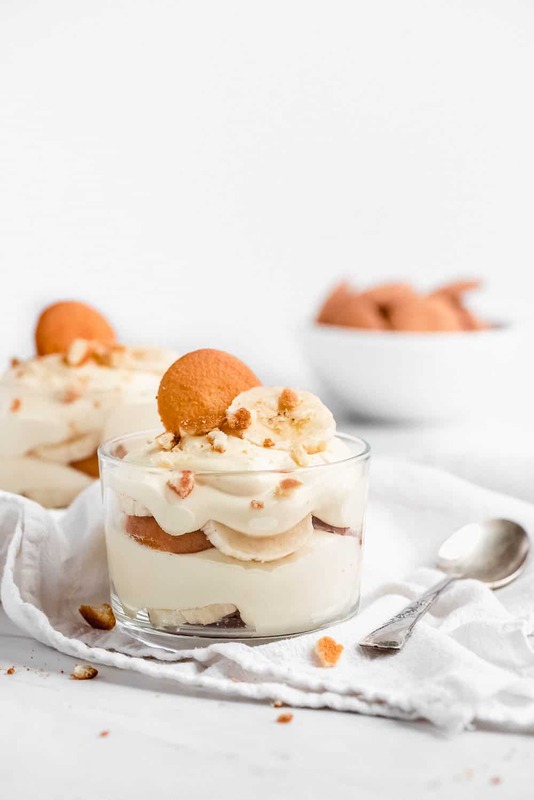 Magnolia Bakery Banana Pudding is a heavenly dessert made up of layers of creamy vanilla pudding, bananas, and Nilla Wafers. It’s the very recipe that the famous New York City bakery uses! This delicious and easy recipe is sure to become a family favorite! Bananas are a staple in our home. We always have them hanging around but often they become over ripe before we get around to eating them. Instead of throwing them out we make something yummy like Banana Bread Crumb Cake, No Bake Banana Caramel Pecan Pie, or Banana Cake with Cream Cheese Frosting. 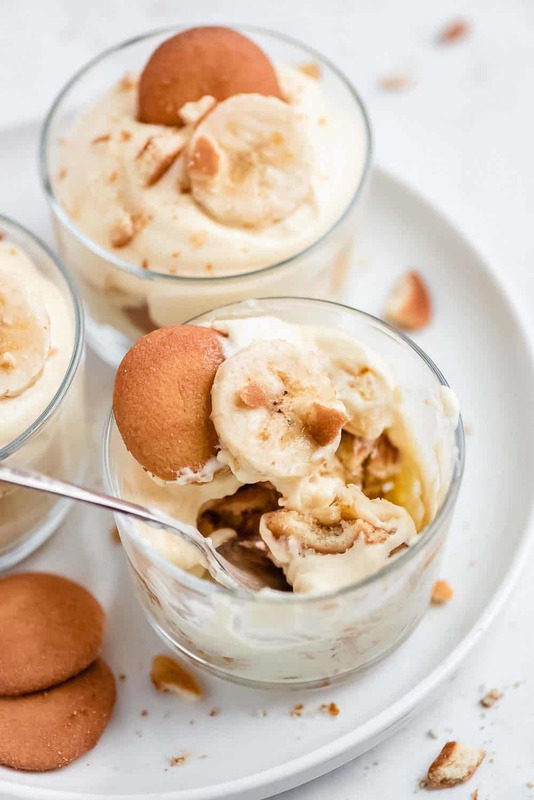 One of my favorite things to do is make restaurant copycat recipes, especially when they’re as good as this Magnolia Bakery Banana Pudding. The amazing New York bakery is famous for it’s cupcakes and banana pudding. There are a few other locations dotted across the country but if you don’t live near one or have a trip planned to visit one, no worries! 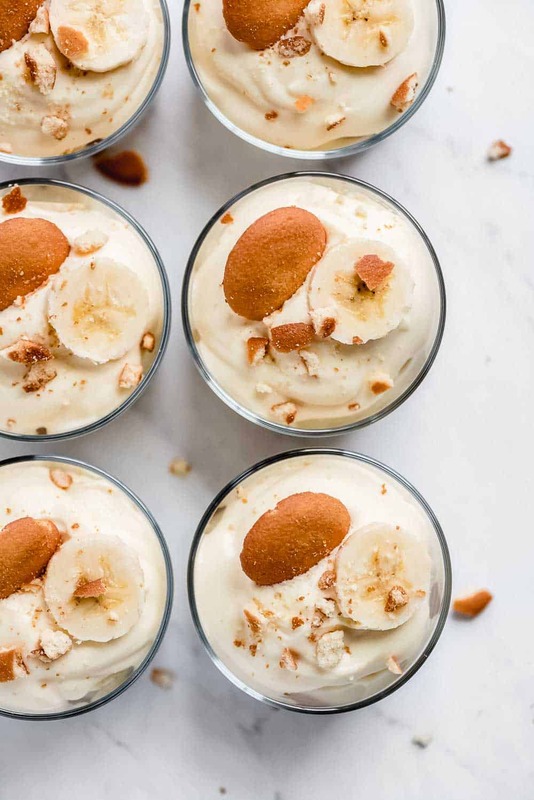 You can make this famous banana dessert right at home! This Banana Pudding tastes just like the real deal because it is! The recipe comes right from their cook book. Not only is it delicious, it’s so easy to make! All it takes is 6 ingredients and one of those is water. 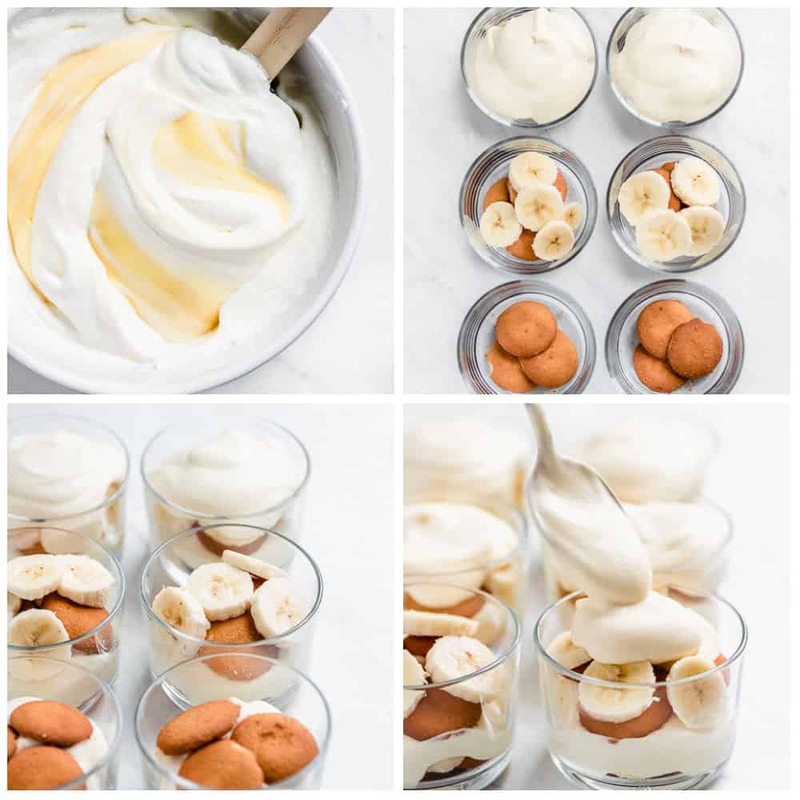 How to make Magnolia Bakery Banana Pudding? Make the vanilla pudding by mixing the box of powdered gelatin with the ice water and sweetened condensed milk. This can be done by hand with a whisk or by using an electric mixer. Once the pudding is smooth and thoroughly mixed, cover and place in the fridge for at least 4 hours or overnight. Whip the heavy cream with an electric mixer until stiff peaks form. Gently fold the cream into the pudding until there are no more white streaks. Assemble the pudding in either a large bowl, trifle dish, baking pan, or individual dishes. Layer the ingredients by first adding a layer of Nilla Wafers, followed by sliced bananas, and then pudding. Repeat layers until you reach the top of your dish(es). Cover with plastic wrap and place the assembled dessert in the fridge for 4-8 hours. Top with the optional additional bananas and Nilla wafers and serve. 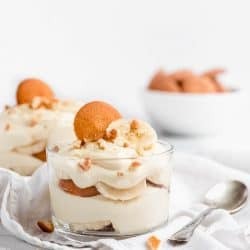 Can I make Banana Pudding in advance? Yes! You need to make it in advance. The actually pudding part of this dessert needs time to thicken in the fridge so it is best to begin this dessert a night or two before you plan to serve it or in the morning at the latest if you are serving it at night. While this particular step needs to be done in advance, the assembly of the dessert should only be done 4-8 hours in advance. How long does Magnolia Bakery Banana Pudding Last? Once the pudding is assembled with the Nilla Wafers, it’s best to eat withing 4-8 hours. You can definitely eat it right after assembling but to get that perfect texture of the cakey Nilla Wafers, it’s best to wait 4 hours so the pudding can soften them. After 8 hours the bananas really start to turn brown and the Nilla Wafers will get even softer and become more of a soggy texture than a cake like texture. Dip or brush the sliced bananas with any acidic fruit juice. This will result in a change in the flavor which is not favorable in some dishes. Where this is the case, use water (it won’t work as well but it will slow the browning). Non-tonic club soda can also be used and won’t affect the taste. It is the oxidation of the fruit that causes it to turn brown. You can slow the oxidation by limiting the oxygen or air. For this recipe, seal the bananas off from the air by completely covering them in the pudding. 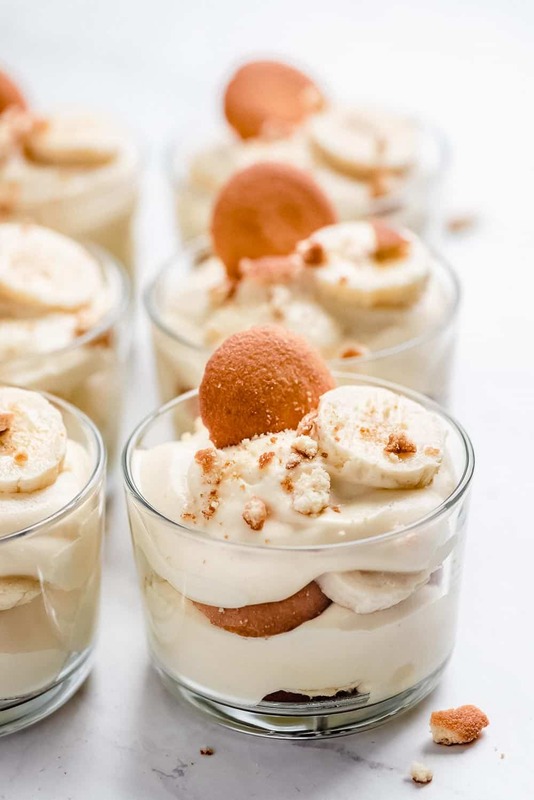 If you plan to serve bananas on top of the pudding, wait to add those until just before eating. Looking for more creamy desserts? Here are a few more! In a large mixing bowl, beat the sweetened condensed milk with an electric mixer while slowing streaming in the water. Add the pudding mix and beat until thoroughly mixed in. Cover pudding and refrigerate for at least 4 hours or overnight so it can can thicken and set up. Beat the heavy whipping cream with an electric mixer until stiff peaks from. Fold the whipped cream and chilled pudding together until there are no more streaks. Cover tightly with plastic wrap and place the assembled dessert in the fridge for 4-8 hours. Top with additional bananas and Nilla wafers (optional) and serve.